If you’re a nonprofit looking to raise money or a company wanting to give back in a way that makes the most sense, Amy Boyle Collins is your woman. A superstar in the fields of cause marketing and sponsorship marketing in New Orleans, Collins is serving this year as president of the Greater New Orleans Chapter of the Association of Fundraising Professionals. 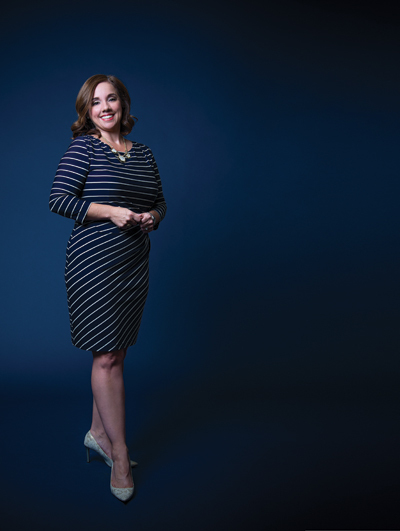 Following years as an independent consultant for nonprofits, Collins ran the Young Leadership Council for six years in the wake of Hurricane Katrina. Under her direction the YLC took over the Wednesdays at the Square outdoor concert series and took it from zero profit to a half-million-dollar operation. Collins says her passion for nonprofits developed in part through serving on various boards and committees, including the Super Bowl host committee in 1996, 2002 and 2013, New Orleans Redevelopment Authority, Committee for a Better New Orleans, Dress for Success and the Catholic Youth Ministry Office of the Archdiocese of New Orleans. Currently, she serves as director of strategy for public relations firm Gambel Communications, which she says has almost doubled in size in the past two years. “I take great pride in the roll I’ve played in making that happen,” she says, noting her work with recent clients including Banner Automotive, Baptist Community Ministries, Fogo de Chao, B.B. King’s Blues Club and Ruby Slipper Restaurant. Mentor: Definitely both of my parents, but my dad specifically taught me my work ethic and not to be intimidated by anyone. I’ve also had a lot of great bosses, including now, Betsy Gambel. She has such an incredible ability to create relationships. Defining moment: I think it was right after Katrina, when I was serving as VP of development on the volunteer board of the YLC. As chair of the Role Model Gala I helped interview the 25 Role Models we were honoring. We laughed and cried together as I asked them about their lives. Some of them are still personal friends of mine. They’ve definitely continued to drive me to achieve and stay involved. Advice for young women: There’s nothing more simple to getting ahead in life than doing great work. Don’t just work hard, work smart. Goals: I’m always looking to do award-winning best practices work for clients. Their success is what drives me. I also want to be a great mom to be boys [Liam, age 6 and Wesley, age 5] and a great wife to my husband, Sherwood. Favorite thing about what I do: I love helping nonprofits succeed by leveraging corporate money for good.